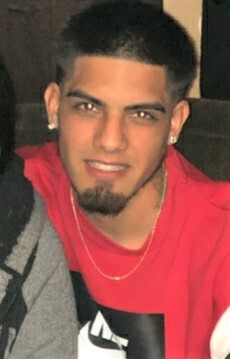 BEEVILLE – Darrin Alan Espinoza, 22, of Beeville, died on Mar. 21, 2019. He was born on Jan. 23, 1997 in Corpus Christi, Tx and had worked as a welders assistant. He is survived by his mother, Dara (Robert III) Camareno of Beeville; father, Luis (Rachel) Espinoza of Beeville; six brothers, Luis III, Cyrus, Ayleus, Vladimir, Jordan and Xavier Espinoza all of Beeville; two sisters, Irene Espinoza of Beeville and Jocelyn Espinoza of Pettus, Tx; maternal grandmother, Anna Marks of La Grange, Tx; paternal grandparents, Luis and Mary Elva Espinoza of Beeville. He is also survived by four aunts, five uncles and one nephew. Visitation will be held on Wednesday, Mar. 27, from 4-9pm at Oak Park Memorial Funeral Chapel. A prayer service will be held at 7pm. A chapel service will be held on Thursday, Mar. 28, at 10am with Rev. Joe Fuentes officiating. Interment will follow at the Our Lady of Victory Cemetery #2. Serving as pallbearers are Luis Espinoza III, Cyrus Espinoza, Ayleus Espinoza, Vladimir Espinoza, Irene Espinoza, Roland Espinoza, Luis Espinoza, Jr. and Robert Camareno III.